iDevices has announced that their devices are now compatible with IFTTT, the “If This, Then That” tool that can be used on mobile devices to string together actions between multiple connected devices based on pre-determined triggers. These “recipes” of functions can be set in one-off situations like receiving a mobile notification when the temperature drops below a specific range or multi-step processes such as turning off the lights and reducing the temperature in the home when geofencing triggers detect the mobile devices is no longer present. One of the big benefits of utilizing IFTTT to connect smart devices such as iDevices is the ability to receive updates via SMS text message outside of normally-programmed notification triggers set by the manufacturers. Visit the iDevices Applet page on IFTTT here, or learn more about the iDevices + IFTTT compatibility here. Take a trip to Tomorrowland at the Walt Disney World Magic Kingdom and you’ll find a quaint view of what the America of yesteryear thought the future would look like. Nestled in the corner of Tomorrowland is one of Disney’s oldest attractions, Walt Disney’s Carousel of Progress. The ride rotates its passengers through four scenes of separate time periods and details the technological innovations of each era (i.e. electric car starters in the 1920’s and television in the 1940’s), with the catchy tune “There’s a Great Big Beautiful Tomorrow” playing between each transition. The final scene differs from the others in that it is a look forward to future technology – at least a vision of the future circa 1993, the last time the ride was renovated. In the “near-future” of the 21st century, we see the family enjoying cutting-edge innovations like virtual reality and voice-activated appliances. If you’re wondering why I’m spending all this time talking about a Disney World ride, don’t worry; Newegg Insider isn’t turning into a theme park attraction review site. I bring up the Carousel of Progress because I rode it for the first time two years ago, and although I found some of it laughable and antiquated at the time (laserdiscs and car-phones in the 21st century! ), throughout my time testing iDevices’ suite of Smart Home products, I kept thinking of that “Great Big Beautiful Tomorrow” envisioned in the ride, and how much my experience controlling my home with the iDevices product line mirrored that final scene. Maybe Disney’s Imagineers were on to something after all. 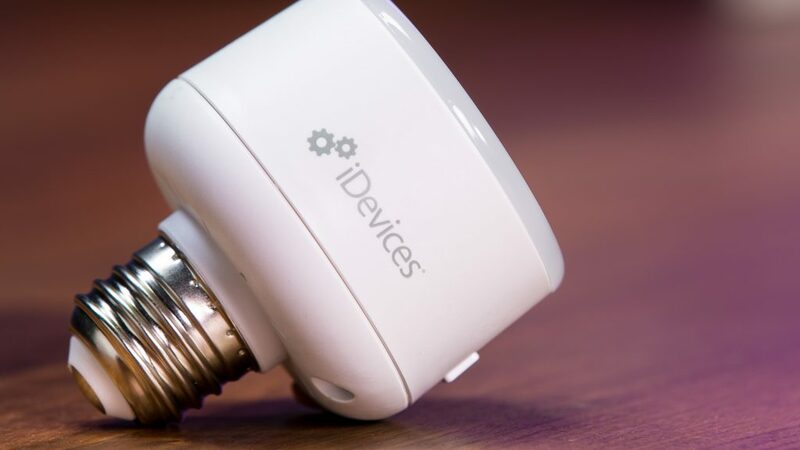 iDevices—a division of Hubbell Incorporated and headquartered in Avon, Connecticut—is a company dedicated to the creation of Smart Home devices. The company stands out from their competition in the increasingly competitive Smart Home market through their commitment to not requiring a hub to set up and operate their products. 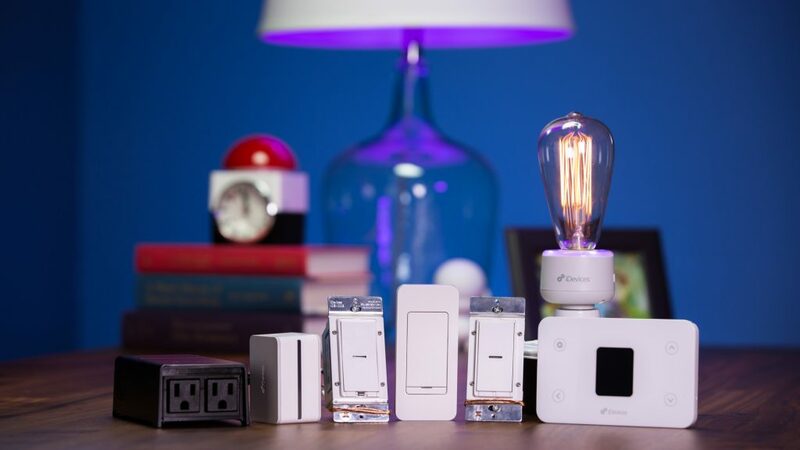 Their product assortment has grown over the years to include smart plugs, wall switches, outlets, and even a thermostat. 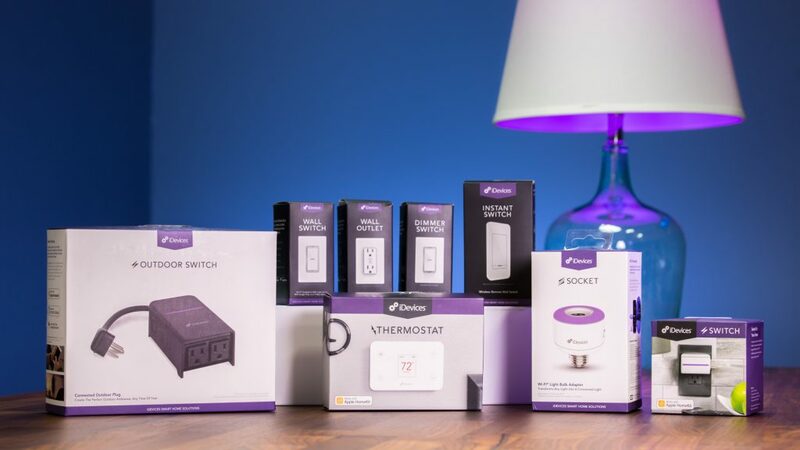 iDevices sent their entire current product range to the Newegg Offices for us to test out: the iDevices Socket, Switch, Instant Switch, Outdoor Switch, Wall Switch, Dimmer Switch, Wall Outlet, and Thermostat. Before this review, my apartment contained nothing in the way of smart appliances or devices. Now, with iDevices’ product line in my hands, I was equipped with everything I needed to bring my apartment into the exciting new world of automated living. The iDevices app— “iDevices Connected,” available on iOS and Android—is the nucleus of the company’s connected experience. For my testing, I used the app with my iPhone X, iPad (5th generation), and Apple Watch. The app is used for setting up and controlling the iDevices ecosystem. The home screen displays the different devices in your home and their current status. You can name each device, filter by room, view energy reports, and set schedules, scenes, and triggers. Scenes are events in which multiple products perform specific actions (i.e. turning on or off) simultaneously. Triggers are specific conditions you can set to activate scenes (i.e. returning home turns on your entryway light and turns the air down to 70°). Triggers are exclusive to iOS. For each device, setup was a cinch: I went into the iDevices Connected app on my phone, pressed “Add Product” from the menu screen, and then followed the onscreen instructions: selected the product I wanted to setup, scanned the linking code on the product (also printed inside the quick start guide), and waited as the app took care of the rest. Keep in mind that the iDevices products must be connected to a 2.4 GHz network. The first time I set up a device, I made the mistake of attempting to set up the product while my phone was connected to my 5GHz network. The app informed me that the network was incompatible with the product, which made me realize my error and switch over to the 2.4GHz band. Of course, with smart devices today, mobile apps are only part of the story. Countless Smart Home platforms and virtual assistants have cropped up to help you run the connected home of the future. The iDevices product line supports the three major players: the aforementioned Apple HomeKit, along with Amazon Alexa and Google Assistant (with one caveat: the thermostat is not compatible with Google Assistant). I used this review as the justification for finally investing in an Alexa device. After all, where else am I going to play Skyrim: Very Special Edition? I used Alexa on a Sonos One and Siri with my Apple HomeKit devices (iPhone, Apple Watch, and iPad). One thing I worried about before setting up my connected home was Alexa and Siri not playing nice together. I am happy to say that I was able to use both smart home platforms simultaneously without any problems. I was shocked how flawlessly I could issue commands to Siri, and then have Alexa realize that Siri had changed the status of a device, and vice versa. For using Siri to control your iDevices products remotely, you must set up a home hub through the Apple Home app. The Apple HomePod, Apple TV 4K, Apple TV 4th or 3rd gen, and iPad can all be set as your home hub. I used my 5th generation iPad as the home hub. The Socket ($49.95) was the first accessory I set up. The socket is a light bulb adapter that screws into any standard size E26 bulb base. It allows you to control the power and brightness of the light bulb from anywhere, The Socket also includes a color-changing LED ring night light, which allows you to create ambient low-light environments, and can be dimmed, turned on and off, and be set to scenes and triggers separately from the actual light bulb connected to the Socket. I originally set about connecting the Socket to my IKEA floor lamp, but that caused the bulb to awkwardly protrude out of the top, so I nixed the idea. After that, I chose to use it in my walk-in closet, which features a light socket on the ceiling. I personally found this to be a much better aesthetic fit, but of course that will all boil down to the end-user’s taste. 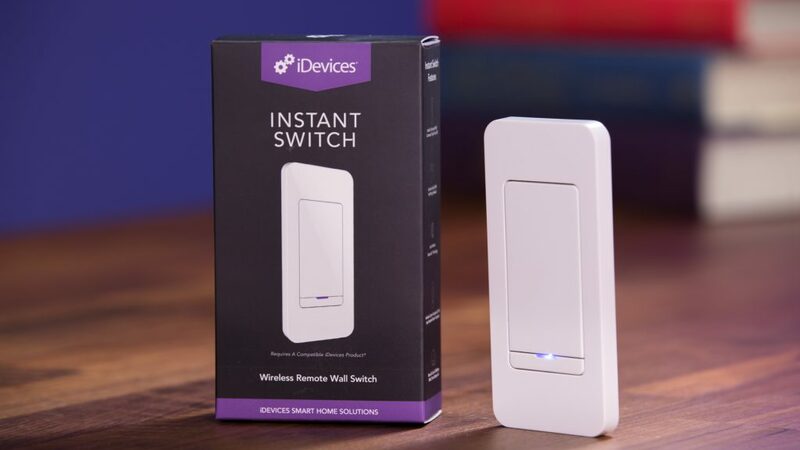 The iDevices Switch($29.95) is a simple but effective smart plug. 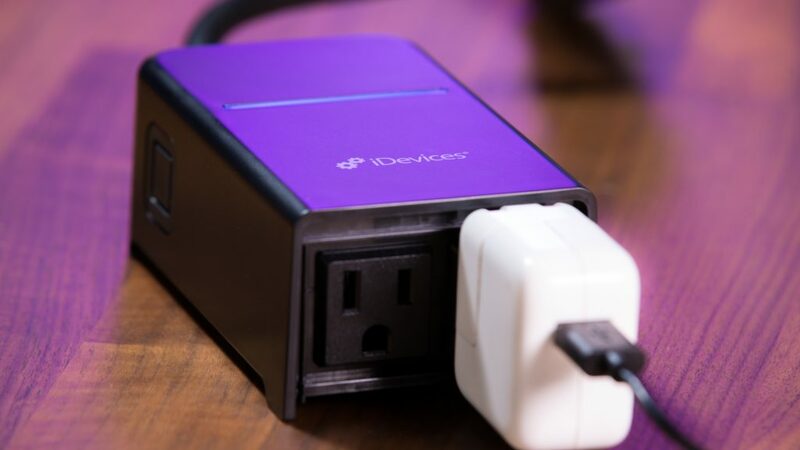 It plugs into any outlet and enables power control, monitoring, and scheduling for any products connected to it. The Switch is small and places the outlet on the side, so it can accommodate devices plugging in through a narrow space like behind a table or sofa. The app will display energy reports with real-time consumption data for any electronics plugged into the Switch. 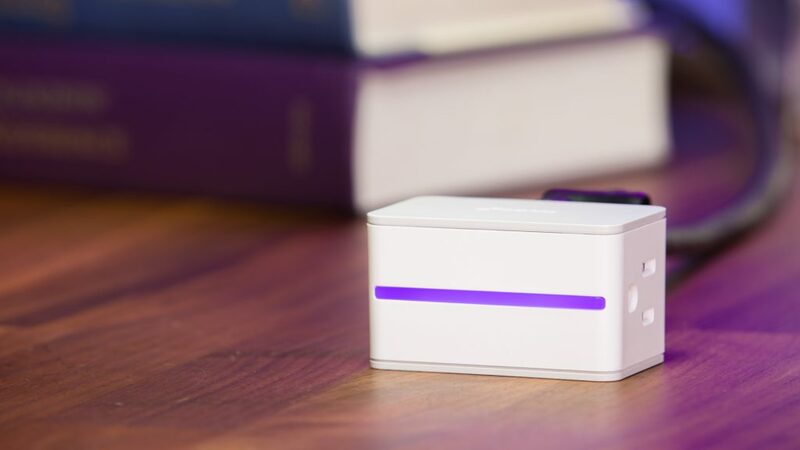 Much like the Socket, it features an LED color-changing Night Light that can be dimmed or powered on or off through the app or Siri (Alexa curiously did not give me the option to control the night light on any of iDevices’ products). Although it doesn’t give off as much ambient lighting as the Socket, the Switch serves as a good inconspicuous night light—as long as you leave it in an open location, of course. 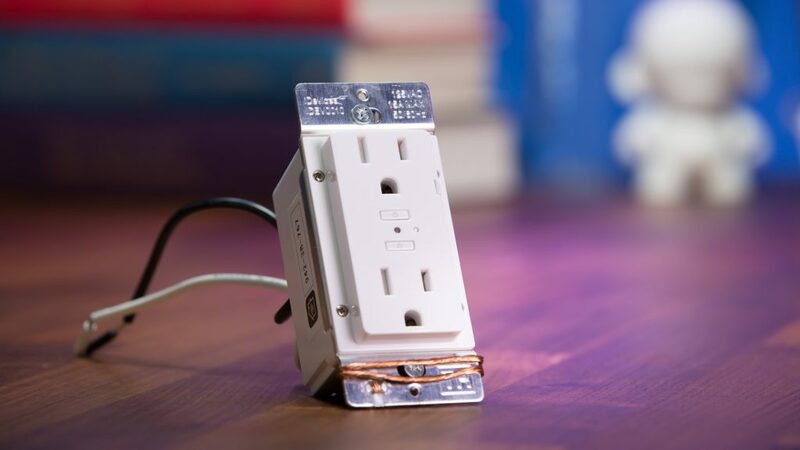 The Instant Switch ($34.95) is a wall switch that can either be stuck on to any surface with an included 3M Command Strip or installed in a multi-gang box and fitted with any standard rocker faceplate. If you elect to use the stick-on 3M strip, the Instant Switch is powered by a coin-cell battery which, according to iDevices, should power it for two years. I elected to use the 3M Strip to stick the switch up to the left of my apartment’s front door; that way, the minute I walked in, I could control whatever iDevice product I linked with a click of the switch. I chose to use it to control the Switch that I connected to my living room light. The setup process for the Instant Switch was even easier than the two other products I set up at that point. After selecting “Instant Switch” under “Add Product” in the menu, the app pairs to the device and then asks what other iDevice product you want to link it to. And that’s it. When my time testing the iDevices came to an end, it was easy for me to remove the Instant Switch from the wall. The 3M Strip was firm enough to not hang limply from my wall, but also not so sticky to leave any damage or markings when I removed it from the wall. The Outdoor Switch ($79.95) is a dual-outlet smart plug designed for the outdoors, with a rugged, rain-tight body to be resistant against conditions like rain, sleet, and snow. I connected the outdoor switch to the outlet on my apartment’s balcony. Full disclosure: I don’t own anything in the way of outdoor electronics, so I simply plugged in a small bedroom lamp and a speaker to the Outdoor Switch for the purpose of this test. In a more realistic application, the Outdoor Switch is perfect for plugging in large light arrays like holiday lights, or flood lights. The Outdoor Switch functioned much like the regular indoor iDevices Switch: it can be powered on and off through the app or via voice control. One thing to keep in mind is that the Outdoor Switch does not offer individual control for the devices it connects to; you can either power them both on or both off. Keeping that limitation in mind, the Outdoor Switch is perfect if you want to expand your Smart Home outside the confines of your walls. The next three products I tested entailed a little more ambitious setup projects. The iDevices Wall Switch ($99.95), Dimmer Switch ($99.95), and Wall Outlet ($99.95) all require a working knowledge of electrical installation: you must turn off the power to the circuit at your circuit breaker or fuse panel, and then connect to the electrical wiring inside the panel you choose to use for the device. iDevices recommends getting help from an electrician if you do not feel comfortable working with electricity, otherwise you face the risk of injury or property damage. Fortunately, I have experience with basic electrical installation, so I was able to connect these products on my own, thanks in part to the detailed illustrated instructions included with each product. I set up the Wall Switch first, replacing the switch for my apartment’s pre-installed overhead light. The light switch was a standard single pole setup, but the Wall Switch also supports multiple switches for three and four-way functionality. 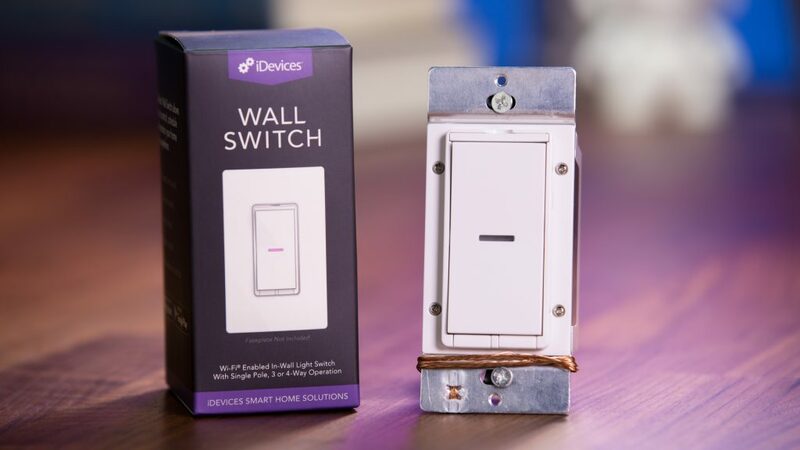 In addition to working like any other non-smart wall switch, the Wall Switch provides the normal benefits of the iDevices ecosystem: app and voice control, scheduling, and automation through scenes and triggers. 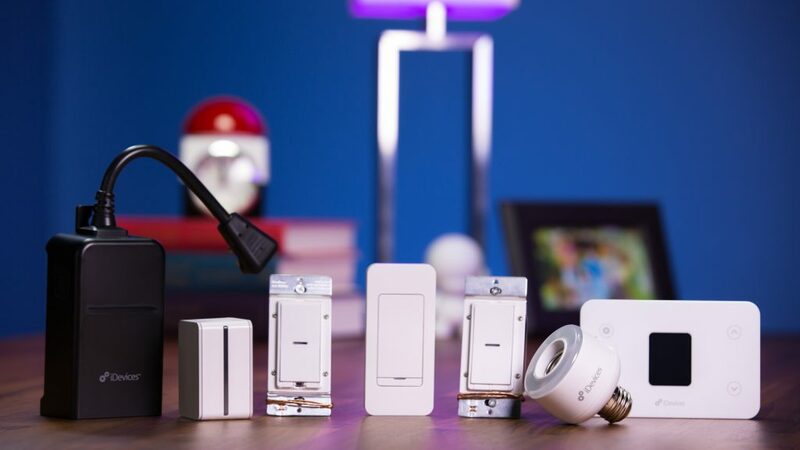 The Wall Switch, much like the Socket and Switch, includes the customizable color LED Night Light, which again can be controlled independently from the Wall Switch itself. The Wall Switch was great for my apartment’s overhead light, because it allowed me to enable smart control for it without having to get up on a ladder to replace or purchase whatever sort of non-standard bulb it uses. I used the Dimmer Switch to replace the switch that controls my bedroom light. 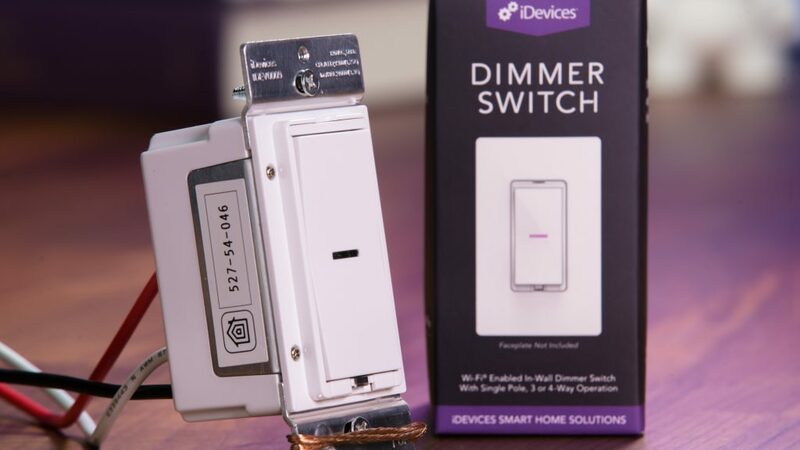 Much like the Wall Switch, the Dimmer variant replaces your existing non-smart wall switch and enables new connected home features. In this case, the Dimmer Switch gives you control over whatever dimmable bulb is linked to the switch’s circuit and enables the standard voice and app control, scheduling, and automation features. The Dimmer Switch also packs in a few nifty unique features: it memorizes your recent brightness settings, so anytime I powered on my bedroom light, it remembered that I liked it set at 40%. It also packs in gesture controls, which function similarly to the multi-touch controls and gestures in smartphones. A single tap on the switch turns the light on and off, a double tap toggles between the minimum and maximum brightness, and pressing and holding allows you to manually dim or brighten the light. The Wall Outlet was possibly my favorite iDevices product. It offers dual control over whatever devices you plug into the outlet, meaning you can control each device individually, unlike the Outdoor Switch. It’s basically like getting two smart plugs in one, but without having to worry about anything protruding from the wall. I used the Wall Outlet with a bedroom light and a speaker, and loved being able to control them individually with the usual voice, app, and automation features. It also contains the ever-popular color-changing night light. The iDevices Thermostat ($129.95) brings the power of app and voice control to your home’s heating and cooling system. With a standard size and shape, white minimalist design and color LED screen, iDevices designed their thermostat to fit the aesthetics of any home. It supports most HVAC systems, and iDevices hosts an HVAC compatibility checker on their site so you can make sure before you purchase. The Thermostat enables you to adjust your home’s temperature to fit your schedule. The dynamic scheduling features available in the iDevices Connected app helps improve your home’s efficiency and can save you money on your energy bills. For example, you can schedule the heat to turn down at the time you leave for work, and have turn back up at the time you usually arrive home. If at any point your daily routine changes, you can pause your schedule and pick it back up later. The app also gives you advanced control over temperature, like Offset Control so you can correct the variance in temperatures between rooms, and set a temperature range: a wide range can help save money and energy, while a narrower range can help maximize comfort. Like the other iDevices products, the Thermostat supports voice control, in this case allowing you to set the temperature. As mentioned earlier, the Thermostat supports Siri and Alexa, but not Google Assistant at this time, so Google Home users will need to weigh the importance of voice control versus simply using the app. Building a Smart Home is all about improving function and efficiency, but knowing just where to start can be confusing. 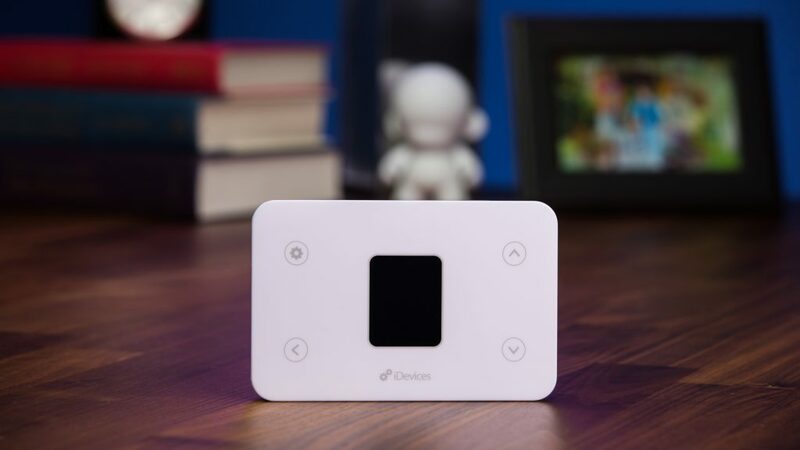 Home automation brands like iDevices offer a full suite of smart devices that make taking the dive into the connected lifestyle much easier.